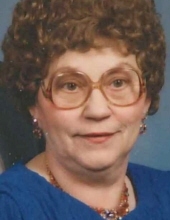 Alice M. Vandehei, 90, De Pere, passed away peacefully Monday morning April 15, 2019. She was born July 14, 1928 to the late Henry and Mary Van Noie. On October 12, 1946 she married Donald Vandehei. Alice was a member of Our Lady of Lourdes Catholic Church, De Pere. For many years Alice was the “Cleaning Lady” at St. Joseph Grade School in De Pere. She is survived by her children; Nancy (Gene) Geurts, Joan (Chris) Danen, Diane (Gary Clawson) Vandehei, Karen Brill, and Rosanne (Ed) Herzog. She is further survived by her grandchildren and great grandchildren. Alice was preceded in death by her husband and their daughter Linda. Friends may call after 9:30AM Monday April 22, 2019 at Our Lady of Lourdes Catholic Church, until the Mass of Christian Burial at 10:30AM with Fr. Brad Vanden Branden O. Praem. officiating. Ryan Funeral Home, De Pere is assisting the family. Please go to www.ryanfh.com to send online condolences to the family. To send flowers or a remembrance gift to the family of Alice M. Vandehei, please visit our Tribute Store. Guaranteed delivery before Alice's visitation begins. Guaranteed delivery before Alice's service begins. Guaranteed delivery before Alice's cemetery begins. "Email Address" would like to share the life celebration of Alice M. Vandehei. Click on the "link" to go to share a favorite memory or leave a condolence message for the family.